Initiated by the Belgian Development cooperation (DGD), the Digital for Development platform was launched in September 2017. Coordinated by Agoria and Close the Gap, it focuses on bringing together all actors of development by creating and facilitating an eco-system for all stakeholders, existing projects and opportunities using digital in development cooperation. The ultimate goal is to build a bridge between the Belgian private sector and the development sector in realizing the Sustainable Development Goals and by creating new partnerships. 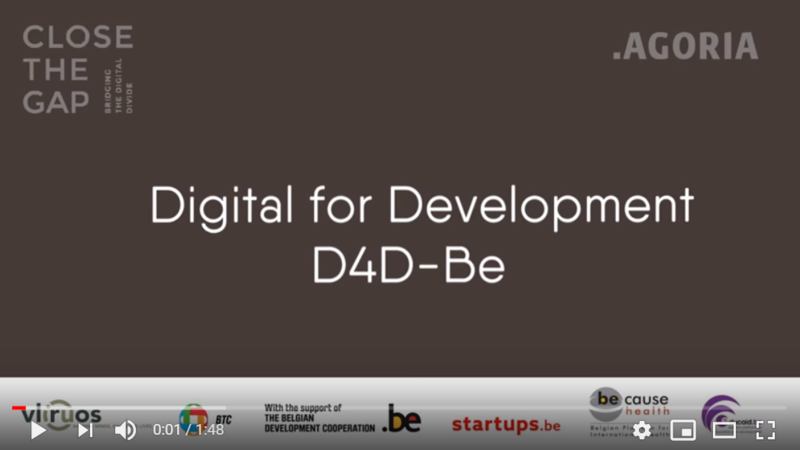 The D4D platform is in continuation of the strategic policy note on Digital for Development (D4D-Be) for the Belgian development cooperation. In order to create this eco-system and nurture potential partnerships, our programme includes a mix of offline events and an underlying comprehensive online platform. From 20 - 23 March, Startups.be and Close the Gap joined forces again to organize an exciting economic mission to Lagos in Nigeria, Africa’s most prominent tech hub, with the most vibrant startup scene that attracts developers and investors from all over the world. Kindling.be was launched on November 20, 2017 featuring best practices, new opportunities, partners (people and organisations) and collaboration workspaces. 2h sessions to meet & greet and understand the need, motivation, added value and expertise of both parties. The end goal is to ignite a potential partnership around digitalization in order to increase impact in development cooperation. Public authorities, companies, NGOs, civil society organizations, academic institutions and research centers met in Brussels to give the Belgian development cooperation a digital impetus. Startups.be & Close the Gap joined forces to organize a unique mission to Kenya, one of the most entrepreneurial countries in Africa, with a start-up scene that attracts developers & investors from all over the world. On Monday April 23, the next milestone of the Digital for Development initiative took place. During this event, interested stakeholders gathered to learn more about the new D4D-Be Financing Programme.